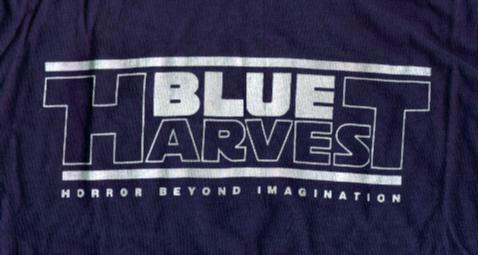 Here's a closeup of a Blue Harvest T Shirt that has a different design than the other Blue Harvest T Shirt pictured in this archive. These were worn by the cast and crew of what was then titled Revenge of the Jedi. The crew pretended to be filming a horror movie, Blue Harvest, to reduce the amount of unwanted fan attention. Horror Beyond Imagination was the imaginary slogan for the film.